First, I should probably say that I am not a couponer. I do coupon for a dinner deal or when I find a coupon for an item I really need because I enjoy a bargain but am not coupon obsessed. That said, I am going to change some of my couponing practices for items I use regularly or know I can donate to causes I support. 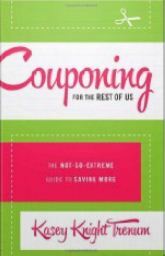 This author presents some very easy ideas for couponing. She has a great writing voice, and I appreciate that she understands those who want to save without coupons taking over their lives. Some of the strategies are very quick and I appreciated the practical advice about what items would best donate where. My favorite part of the book addressed the key issue I have with most couponers. As a Christian I’ve often wondered how people who coupon could justify checking these values at the door to save a few dollars. Several wonderful women I know make choices when couponing that shock me and totally put me off couponing all together. I loved the scripture in this book and the candid discussion about issues with peelies, tear pads, using expired coupons, and attitudes towards cashiers. Instead of a quote that caught my attention, here is my favorite idea: If using multiple coupons, stack them on top of each other and staple on the picture before cutting them out. It means you only have to cut once and creates your own mini tear pad.